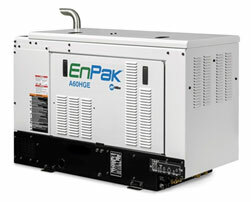 Who better to share the best service truck air compressors for the upcoming year than service truck operators? 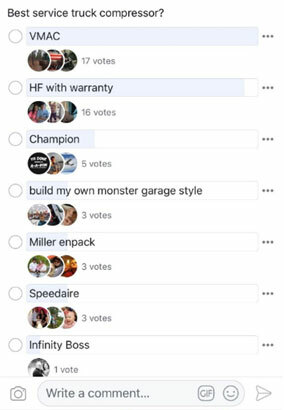 A recent poll on Facebook in the Service Trucks group, which has 17,000 members, asked what service truck operators across the United States and Canada think are the best service truck air compressors. In today’s article, we’re going to take a quick look at your top picks. 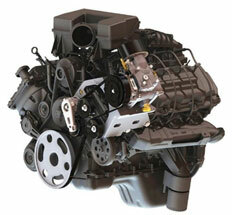 VMAC’s flagship product, UNDERHOOD™, revolutionized the way air compressors are mounted to a vehicle. By placing the individual air compressor components within the engine compartment, VMAC frees up space and ditches unnecessary weight. After UNDERHOOD™ took the industry by storm, VMAC released several additional vehicle-integrated and stand-alone air compressors, all of which are built specifically for service trucks and vans. If you’re looking for something a little less sophisticated, with lower power and a price tag to match, buying an air compressor from Harbor Freight is a decent option. It’s important to note that Harbor Freight doesn’t actually make air compressors—rather, they’re a reseller of a few inexpensive, low output (under 20 CFM) brands. Harbor Freight’s Extended Service Protection (ESP) is what makes these air compressors so desirable for the casual air user. Harbor Freight will replace, repair, or refund your purchase with the purchase of a 1- or 2-year coverage plan. This warranty program is a great way to get piece of mind when buying lower price-point air compressors with a shorter lifespan. Champion is best known for its reciprocating air compressor models and, as far as recips go, Champion tends to make a version that’s higher quality than most on the market; Champion doesn’t make the toss-away reciprocating air compressors that get thrown off the back of trucks when they die. Champion’s air compressors are also backed by a standard 3-year warranty for the air compressor pump, with the option to purchase a premium extended warranty for an additional three years. Other package components are covered for one or two years, respectively. If you’ve decided that a reciprocating compressor is right for you, Champion is a great option to consider. Here’s to all the innovators! Building a new machine out of nothing isn’t for the faint of heart, but it makes sense that daring, mechanically-inclined individuals would build their own systems. DIY air compressors can be a great solution for those who are on a shoestring budget, need lower CFM outputs, and are happy with a machine that will only last a few years. Speedaire is an air compressor brand sold exclusively by Grainger, an industrial distributor that’s become fairly well known across North America. 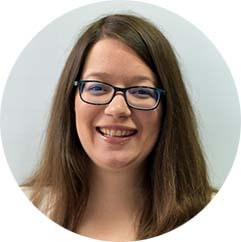 However, it’s not the actual manufacturer of the systems—instead, Speedaire is a rebrand of a variety of existing air compressors and operators have suspected Champion, Campbell Hausfeld and overseas brands in their repertoire. 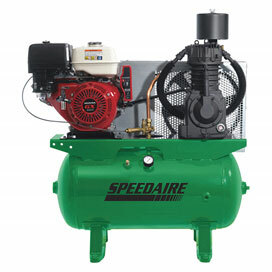 Because of Speedaire’s medley of manufacturers, it’s a bit tough to talk about Speedaire as a collective brand, but the brand does have a good reputation for decent-quality reciprocating air compressors and excellent customer support. 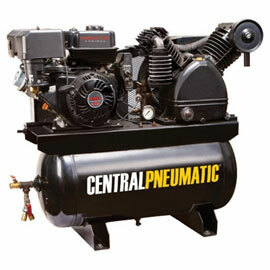 Speedaire is best known for its portable gas and electric shop compressors, but also includes a small line of air compressors that can be properly mounted to a vehicle. 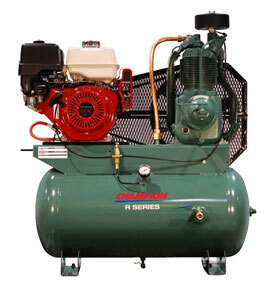 These reciprocating air compressors are gas powered with a Honda engine, and offer up to 24 CFM of compressed air. The Speedaire line also falls under Grainger’s standard warranty, which backs its equipment and products for 1 year from the date of purchase. While this isn’t a great warranty, it’s better than nothing. At the end of the day, Speedaire is a potential option for operators who only need low-output bursts of air or for operators who need a shop compressor that can be easily moved between two or more locations. Air Tool Consumption Chart: How Much Air Do I Need?